Two civilians, aged 16 and 62, were killed in the de facto independent Nagorno-Karabakh republic over the past two days and a criminal investigation has been launched, the Azerbaijani Prosecutor General's Office said in a statement Tuesday. 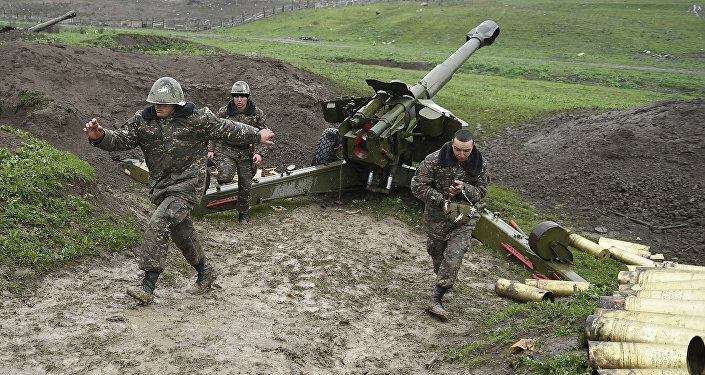 BAKU (Sputnik) — Azerbaijan and Armenia reported intensified fighting in the disputed Nagorno-Karabakh region on April 2 with the sides accusing each other of violating the ceasefire agreement which had been in place since 1994. "Garash Dadashov, a shepherd born in 1954, died on April 4 at 5:00 p.m. local time [13:00 GMT] from an artillery shell that exploded near the mosque in the village of Ahmadagali where he tended sheep," the statement said, adding that five residents of the village were injured. "A resident of a village in the Kalbajar region, Hasangayya Hasanli Turan, born in 2000, died immediately of shrapnel wounds," the statement said. The Nagorno-Karabakh conflict began in 1988, when the Armenian-dominated autonomous region sought to secede from the Azerbaijan Soviet Socialist Republic, before proclaiming independence after the Soviet Union's collapse in 1991. In September 2015, the conflict escalated, with the sides blaming each other for breaching the truce.